The origin of high heels has been traced back to Persian men in the early 10th century. Since horses were the main mode of transportation, men wore boots with inch-high heels to prevent their feet from slipping out of stirrups. As Persians began to interact with Europeans, the heel craze erupted. Soon, European men were wearing high heels in order to show their status; the added height indicated their nobility and marked them as well-traveled members of society. King Louis XIV of France, a known trendsetter and shoe collector, was the first notable male to wear the heel. At five foot, four inches tall, he was slightly shorter than the average male of his time. Lisa Small, Curator of Killer Heels: The Art of the High-Heeled Shoe, shown at the Brooklyn Museum in 2014 states, "Height and elevation has always had something to do with indicating class, privilege, and power.” Naturally, as a king, Louis the Sun King wanted his stature to match his power. He sported four-inch heels decorated with different battle scenes. When he had conquered the issue of height, King Louis turned to style. He decided that all of his shoes needed red heels (Hello, early Louboutins) and that his friends should sport the same look. In period France, a person could tell if someone was close to the king and in his inner circle by looking at his feet. Women took cues from men’s fashion. In an attempt to be viewed as equal, women used their garments as signifiers of wealth and status. Soon, traditionally masculine indicators like short hair and heels were seen on women. “They would smoke pipes and wear hats that were very masculine. This is why women adopted the heel, it was an effort to masculinise their outfits” says Elizabeth Semmelhack of the Bata Shoe Museum in Toronto. Their adoption of the heel was simply another way to infuse their appearances with masculine aesthetics. As the trend spread, men and women of the upper classes began to consistently wear heels. Soon, lower classes began to adopt them, too. Rejecting associations with lower classes, the upper class sought to differentiate themselves with higher and higher heels. During this time, separate styles for men and women’s heels emerged: chunky heels for men’s shoes, and skinny heels for women’s shoes. As trends bent towards higher and thinner heels, they became associated more strongly with women. Semmelhack explains further, “Female desirability begins to be constructed in terms of of irrational fashion. Once the high heel was separated from its original function of horseback riding, it became a primary example of impractical dress.” During the subsequent Victorian Era, heels fell out of favor with men entirely. Since the 18th century, men have traditionally sported only very low heels, like those on boots. Throughout the modern era, heels have occasionally been reintegrated into men’s fashion. During the 1960’s, John Lennon stood at the forefront of the Peacock Revolution, a movement in men’s fashion to reclaim the right to extravagant dress. These boots, a precursor to the modern Chelsea boot, sport a notably higher heel. Elton John took this movement even further in the 1970’s, opting to wear elaborate, seven and a half inch Ferradini platform shoes for performances. 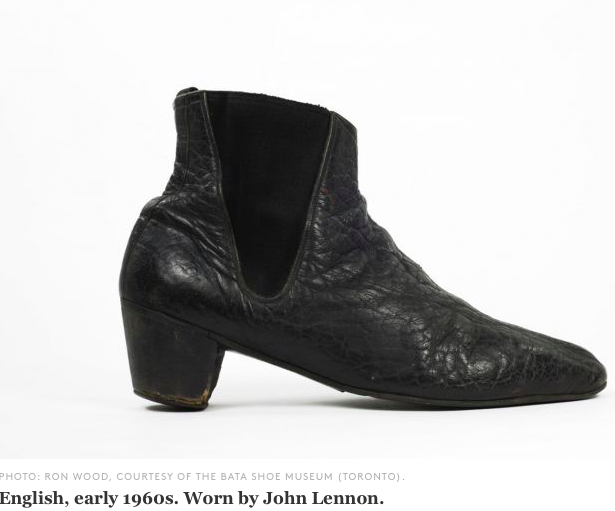 With Lennon and John as icons, men in the 70’s openly sought shoes with distinct heels. In the present day, the disintegration of the gender binary is making waves in the fashion world. Designers no longer adhere to traditional notions of “typical” attire for men and women. The high end fashion brand Saint Laurent proclaimed in a recent ad campaign that they want to create clothes and accessories that people feel confident in, no gender designation required. Their heeled bootie, offered in both a metallic silver and high shine gold, pushes the boundaries of a typical shoe designed for men. This particular style retains historical equestrian vestiges in men’s shoes, while remixing notions of masculinity to the meet changing demands of consumers who desire a less traditionally masculine boot.